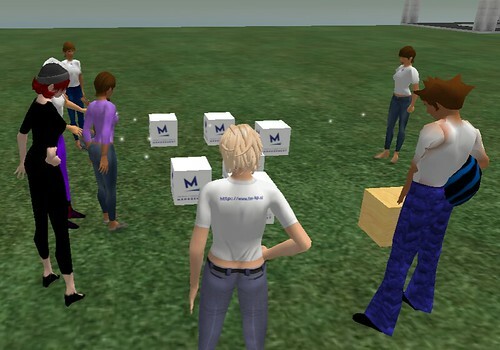 In my previous post I wrote about the plans of having virtual meetings in Second Life with our postgraduate students of the E-business Management course. And I’ve got good news! The first virtual meeting tool place yesterday evening our time (12.00 SL time) in Sloodleville. 7 of our students attended the meeting (+ 1 that only managed to be with us for a short time, because her SL client kept crashing), which is more than we ever dared to expect in the first week (and we didn’t even offer extra points for attendance!). Aren’t we pretty? ;) We also had a drink, tried dancing a bit, and we learned that not all boxes are meant to be worn. All in all it was a lot of fun, although we did have some minor technical problems (I think we can officially call technical glitches a SL feature; now I understand what “perpetual beta” means ;) ). I had a lot of fun during our 1,5 hr long class, and I hope the students also enjoyed it. One of the things I really enjoyed was seeing students that thought they didn’t have enough knowledge/experience with computers to be be successful in our course catching up on new concepts in SL very fast. I’m so proud of them, and I think that this experience can help them become more confident ICT users in general. Also, the first student feedback was very positive, so I hope they keep attending our meetings, and that we’ll have a lot more fun in the future. What more can I say? 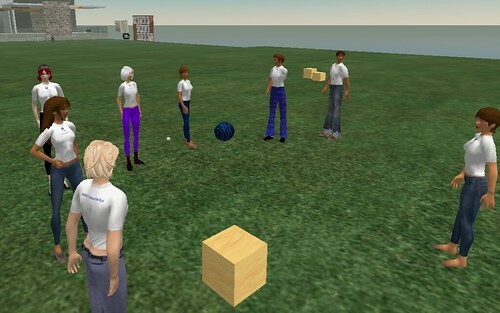 Teaching, and interacting with students in SL is fun! Seeing the students’ avatars adds another dimension to online communication. I usually don’t like text-only synchronous chats with multiple users, but chatting with multiple avatars in SL is really engaging. It still isn’t as good as having a real conversation with the students, but it comes close. Especially if you consider the fact that we were able to meet in a virtual place, while still being in the comfort of our own homes, wearing our pajamas :) So my decision is that I’m not giving up on Second Life. It does have a lot of problems (especially technical), but the learning/teaching potential of virtual worlds that can already be seen in SL is just too tempting to ignore.